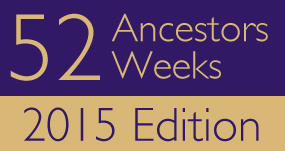 The theme for Week 4 of the 2015 edition of the “52 Ancestors in 52 Weeks” challenge is “Closest to Your Birthday” and my ancestor that holds that dubious distinction is my 4th great-grandfather, Dionys Daniel. Truth be told, I never noticed that Dionys’ birthday was close to mine until I looked in my database for this week’s challenge. But I have always admired Dionys because he has one of the coolest names of all my ancestors! Dionys is the German form of the name Dionysius, the Greed god of wine, revelry, and debauchery. I wonder if young Dionys was a rabble-rouser that lived up to the name or the complete opposite? Of course, the name shouldn’t only be associated with the infamous Greek god – it is also the name of several saints, and there are monasteries and churches dedicated to St. Dionys throughout Bavaria where my Dionys, status of saint or sinner unknown to his descendants, was born. Dionys Daniel was born on 07 March 1784 in the small town of Niederscheyern in Bavaria. He was the son of Anton Daniel and Anna Maria Olfinger. The statue of Mary and Jesus in the Church of the Annunciation dates back to 1500! The church itself is unchanged since 1752, so it is the church in which Dionys was baptized, married, and died. I don’t know much about Dionys’ life, so I investigated the town in which he lived. Niederscheyern, or “Lower” Scheyern, lies in the shadow of the larger town of Scheyern. For centuries, Niederscheyern was a popular pilgrimage site itself. 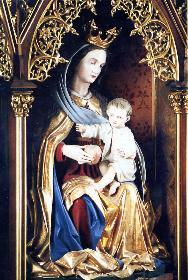 In the early 16th Century, miraculous powers were attributed to a statue of Mary in the Church of the Annunciation (Kirche Maria Verkündigung). The miracles and answered prayers attributed to Mary’s intercession were recorded in “miracle books” – from 1635 to 1804 there are over 16,000 entries of thanksgiving. The books still exist today in the library of the Benedictine abbey of Scheyern. The abbey also had a relic of the Holy Cross from Jerusalem – since 1180 – and many pilgrims came from all over Bavaria to pray there. The abbey was also the Wittelsbach family monastery (the Wittelsbach dynasty ruled over Bavaria for over 700 years into the Twentieth Century). My Dionys wasn’t part of the royal family, however. He was merely a farmer living in Niederscheyern. I have no evidence of what his crops were or how much land he owned, but when I visited the area the primary crop is hops. In fact, hops growing is so prevalent that it is known as “green gold”. The Catholic faith seemed to govern all aspects of Bavarian life at the time, and I wonder how closely his farming life revolved around the seasons of of the liturgical year as closely as the calendar year. One thing is certain – he lived during an interesting time. On 21 March 1803, a big change came to the Scheyern Abbey – the abbey was dissolved under the “secularization” of Bavaria. Dionys was 19 years old and grew up with the Abbey as the center of life in the area – how did its closure affect him? Or his livelihood as a farmer? Or the surrounding towns? All I know is that the monastery came to life again during his lifetime – in 1838, Ludwig I of Bavaria re-established the monastery, and the monks returned. On 11 September 1809 he married Walburga Schober – he was 25 years old and his wife was 31. In 1812 they had a daughter, Anna Maria, who is my 3rd great-grandmother. They also had a daughter named Rosalie, but I’m not certain of her birth year. I don’t know much more about Dionys’ life other than his death date, which was 25 May 1873. He was actually alive when my great-grandfather, Joseph Bergmeister, who is Dionys’ great-grandson, is born. I hope he got to meet him. Dionys lived to be 89 years old, and what is amazing about this fact is that he outlives all of my direct ancestors in his line. One of his descendants, his great-great-granddaugther who is my grandmother’s sister, finally beats his age when she died at the age of 92 in 1990, more than two hundred years and four generations after his death. While 89 is an admirable age at death, life as a farmer in the 19th century had to be difficult and physically demanding, so making it to that age is rather impressive. Maybe Dionys didn’t live up to his Greek god namesake with a life of revelry (or maybe he did and that was his secret to good health)!